Caiman free games: Pacman Worlds by Danjo Boyd - Danjosoftware. Game by danjo & TSAP Media. Guide Pacman around many themed worlds. Collect all the Hidden and protected Gems, to bring back balance in Pacman World, where the Ghosts have been too dominant. The Ghosts have special powers, depending on thier alignment to nature. The Red ghost for example is aligned to fire, and lights fires that will burn pellets, and Pacman too. The Yellow ghost is aligned to Air, the Blue to Water, and Purple to Earth. There are also some special ghosts who keep law and order in Pacman Worlds. Travel through towns, fields, forests, icecaps, mountains, and defeat terrible foes, such as the Pirate Ship, Ancient Tree, Snow Giants, and Huge Dragon. 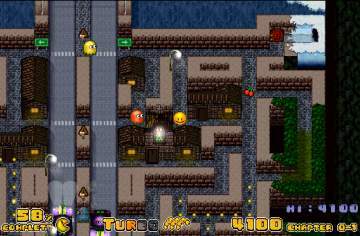 Pacman has special abilites, and powerups to help him on his quest, and there are many hidden games locked away inside to have fun with.